A federal judge has denied the ACLU’s request for California voters to be allowed to take and share “ballot selfies” when they go to the polls Tuesday. Judge William Alsup of the U.S. District Court of Northern California said he was denying the ACLU’s request because of the “lateness of the request” and to avoid the risk of confusing voters. “It’s unfair to the voters of California, to people who run polling places and to the secretary of state to jam this down their throats at the last minute,” the judge told ACLU attorneys. He said changing the longstanding law could lead to retraining hundreds of workers at more than 14,000 poling places across California’s 58 counties. 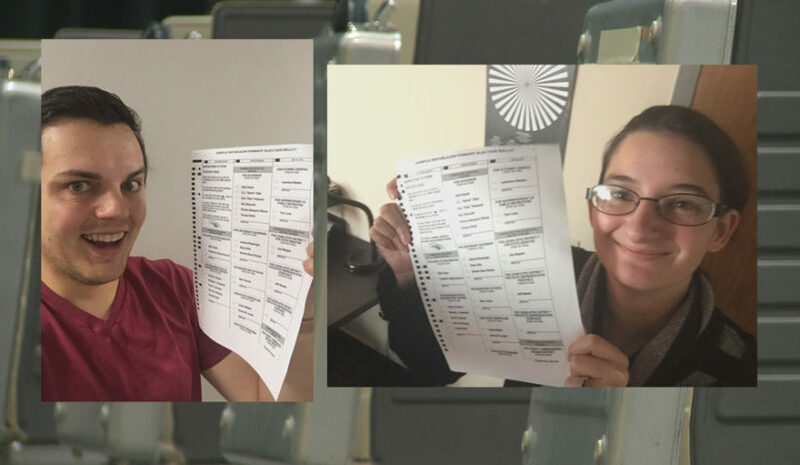 Alsup agreed with the state attorneys, saying there were many “nuanced decisions” about rules for ballot selfies that required thought and could not be made at the last minute. The issues include whether to allow selfie sticks, whether to allow a voter the time to keep taking photos in hopes of getting the perfect shot, whether to permit a voter to talk while taking a video selfie in a voting booth and whether to allow photos of other voters at the polling place, he said. “This is a half-baked idea. I don’t think you’ve thought this through,” he told Risher during his argument. “It’s not so simple. Will a voter be allowed to go into a voting booth and use one of those sticks so that the voter makes sure their face is in it? And, then they’re going to check it to make sure it picks up everything,” said Alsup to chuckles in the courtroom. “Then let’s say they don’t get everything, can they try again? How many times can they keep trying? What if they don’t like the smile on their face? They have to get the face, the smile, the ballot all just right. The civil rights group filed the suit against Secretary of State Alex Padilla on Monday, saying it was concerned about the “chilling effect” the ban could have on voters’ free speech. A new law signed by Gov. Jerry Brown this year will repeal California’s ban on sharing photos of marked ballots, but it doesn’t take effect until January 1. He said voters may want to post ballot selfies to show support for particular candidates or issues or to encourage others to vote. In a statement, Padilla reiterated that Alsup’s ruling means ballot selfies are not authorized for the Nov. 8 election. Voters are still allowed to use their smartphones to do research or look at notes in the voting booth and may still take photos with their “I Voted” stickers, he added. In recent years, civil rights groups like the ACLU have argued that this is an outdated law that prevents voters from exercising crucial political speech and discourages the use of technology in get-out-the-vote efforts. Currently, 18 states ban the sharing photos of voter ballots, while 6 other states prohibit taking photos in polling places but allow for photos of mail-in ballots. Judges in Indiana and New Hampshire have ruled against bans on selfies in those states, and a lawsuit challenging New York’s ban is pending. Compiled from news reports by the Los Angeles Times, CNET and the San Francisco Examiner. Reprinted here for educational purposes only. May not be reproduced on other websites without permission. 1. On what grounds did the ACLU request a judge allow voters to take selfies in the voting booth? 2. For what reasons did the judge deny the request? (What issues did he say must be considered?) Be specific. 3. Democratic Governor Jerry Brown signed a law that repeals California’s ban on sharing photos of marked ballots, but it doesn’t take effect until January 1. What is the intent of the current law (which has been on the books for 125 years)? 4. How did ACLU attorney Michael Risher respond to the judge’s ruling? 5. For what purposes are voters in California currently permitted to use their smart phones on election day? 6. a) In how many states are there currently bans on sharing photos of voter ballots? b) What do some other states prohibit? The ACLU has argued a ban on ballot photos is outdated – that it prevents voters from exercising crucial political speech and discourages the use of technology in get-out-the-vote efforts: that it has a “chilling effect” on voters’ free speech. a) Do you think a ban on selfies taken with a voter’s completed ballot prohibit the voter’s free speech? Explain your answer. b) Do you agree with Assemblyman Levine’s assertion that the ban is “unconstitutional”? Explain your answer. 8. Bans on photos of completed ballots do not prevent voters from telling everyone HOW they voted, just prevents them from proving it by taking a picture of their ballot. The purpose of the current law is to prevent voter intimidation or vote buying. a) How might the new law allowing people to take a photo of their completed ballot enable someone to intimidate a voter into voting for a particular candidate? b) How might the new law enable a voter to get paid to vote for a certain candidate? The secret ballot is a voting method in which a voter’s choices in an election or a referendum are anonymous, forestalling attempts to influence the voter by intimidation and potential vote buying. The system is one means of achieving the goal of political privacy. Secret ballots are used in conjunction with many different voting systems. The most basic form of secret ballot uses blank pieces of paper, upon which each voter writes his or her choice. Without revealing the votes to anyone, the voter would fold the ballot paper and place it in a sealed box, which is emptied later for counting. An aspect of secret voting is the provision of a voting booth to enable the voter to write on the ballot paper without others being able to see what is being written. Today, printed ballot papers are usually provided, with the names of the candidates or questions and respective checkboxes. Provisions are made at the polling place for the voters to record their preferences in secret. The ballots are designed to eliminate bias and to prevent anyone from linking a voter to a ballot. The first city to start using the Australian ballot in the United States was Louisville, Kentucky, and the first state to adopt the Australian ballot was Massachusetts. For this reason it is also known as the “Massachusetts ballot”. In the U.S., voting by secret ballot was universal by 1892 but criminal prohibitions against paying people to vote were instituted in 1925.